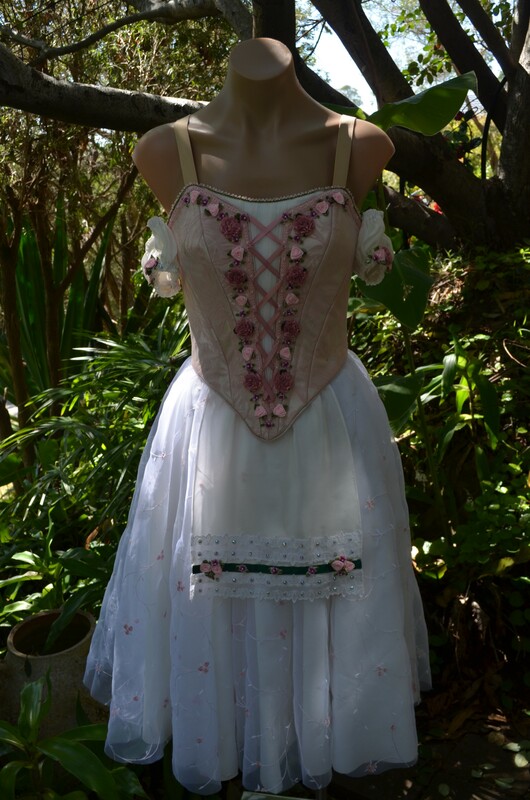 The peasant costumes in ballets are lovely, whether they have large fluffy skirts, tiered Spanish skirts, or like this one, a low profile full circle skirt that stays close to the dancer’s legs. 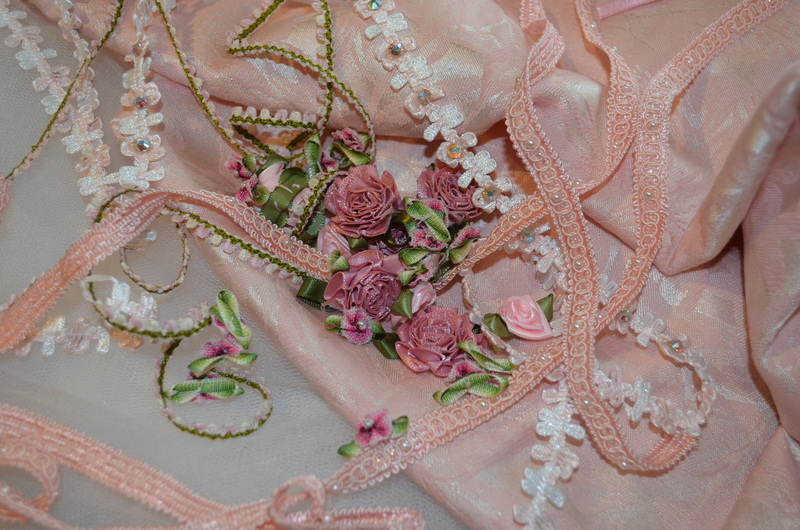 Here is the starting point for a very pretty Swanhilda costume. Sometimes the decorating ideas will change as I move trough the construction phase. The white braid for example didn’t make the final cut and some other flowers were introduced, discarded and then reintroduced. I’ve learnt to let go of ideas! The first fitting for a bodice uses a calico (muslin for US readers) mock-up of the bodice to which I make changes and then translate to a pattern for the bodice. 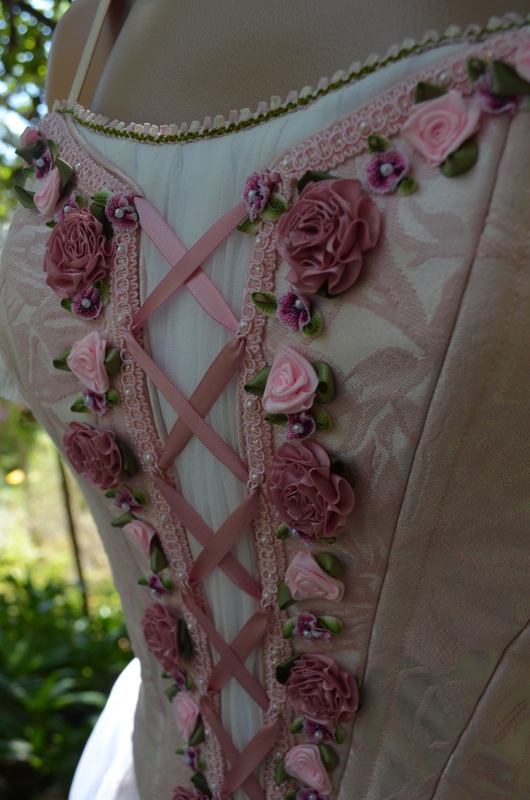 The bodice is then made up with it’s drill lining but with no piping or other finishing. The second fitting helps take account of the thicker fabric and the drill lining. After this I add piping and boning. The third and final fitting is at completion and is basically for finalising the hooks and bars. 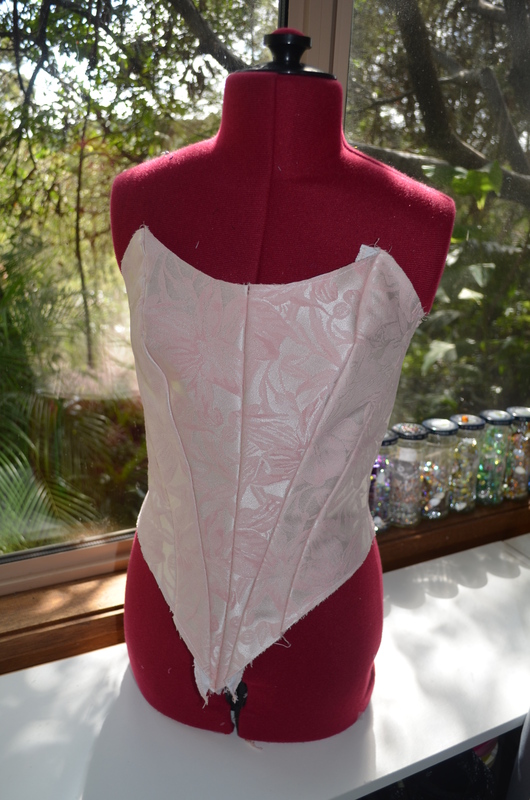 This bodice will have a faux corset insert so the centre front needs to be opened up and trimmed away. 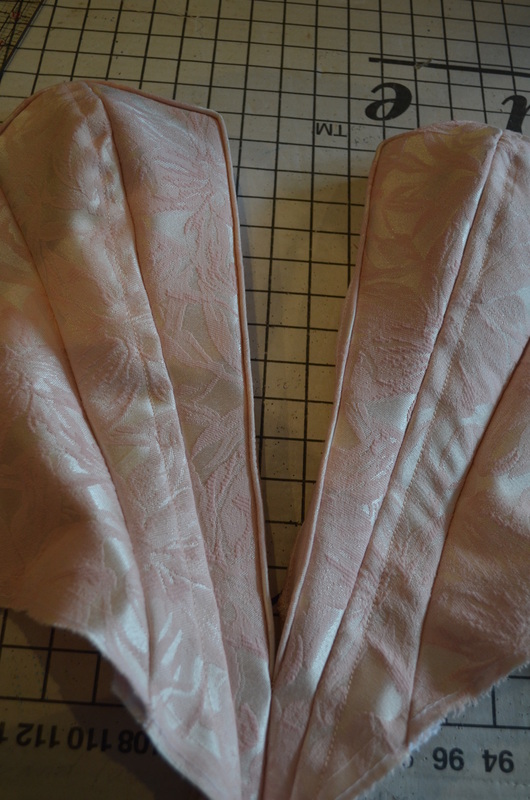 The piping allows me to sew attach the faux corset insert by stitching in the ditch. The corset insert should look like the corset is laced over a soft chemise. For this effect I gather tissue silk over the insert. 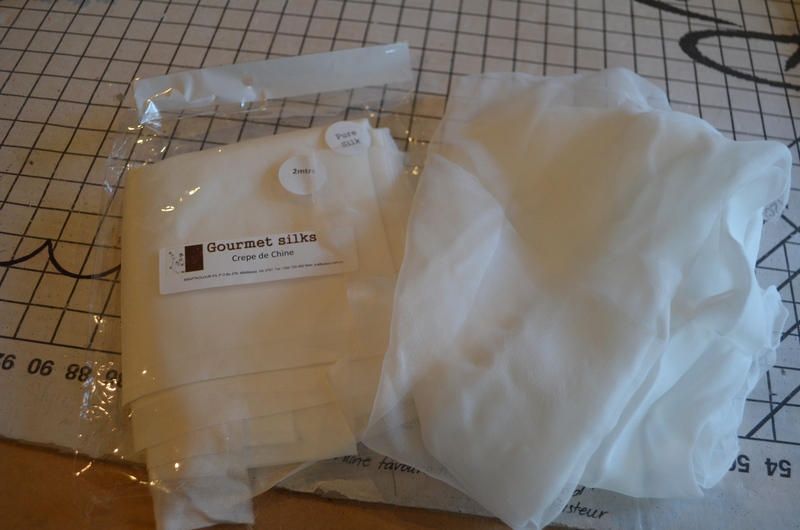 This type of silk is not very expensive and I try to always have some on hand. I think it is superior to using polyester as it sits flatter when it is steamed or ironed. The tissue silk is for the ruched corset insert and the crepe de chine for the arm puffs as the tissue silk is a bit too light for the puffs. 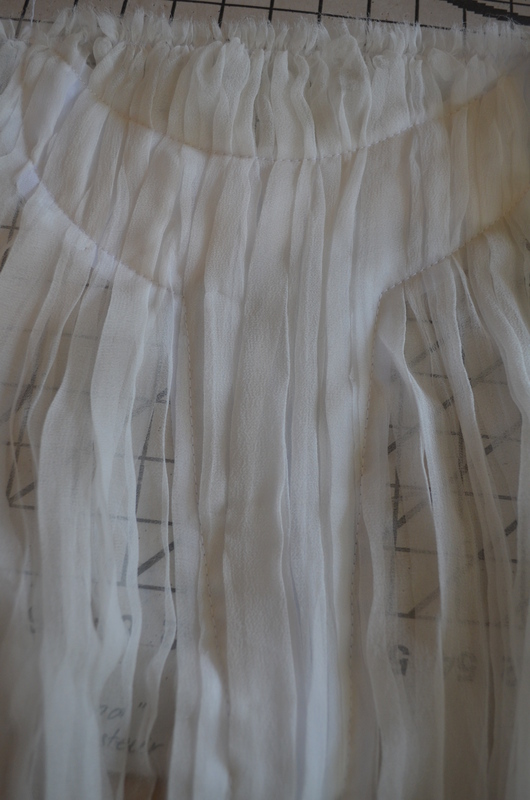 The excess silk is trimmed off the insert and it is stitched into the bodice opening. Now comes the fun part, starting the placement of decorations. 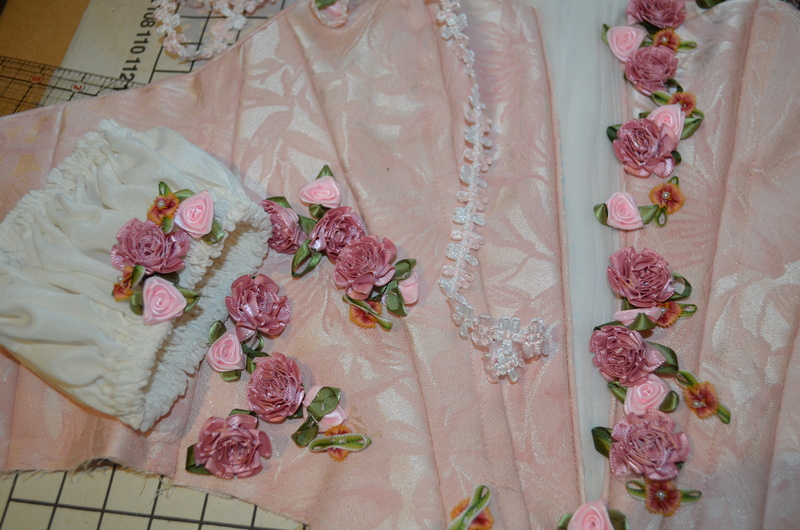 I thought I’d add in some other ribbon flowers to bring out the apricot colours in the bodice but they started to shout to me so I swapped them over for the original colour. 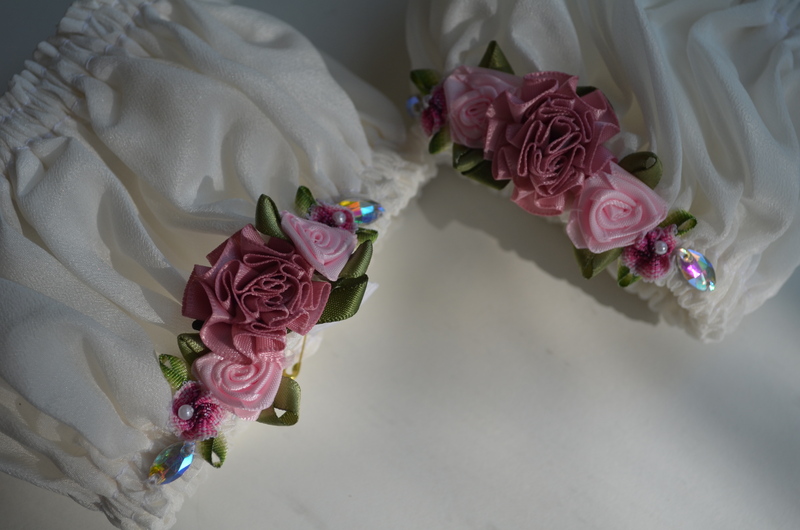 You can see below the crimson ribbon flowers work much better with the dusty pink ribbon roses and still gives a point of interest to the design. I also solved the perennial problem of trying to line up the laces on a faux corset by using a gimp trim that I could thread the laces through; instant symmetry … YAY me! Some cute little arms puffs and an apron completed the picture. The skirt was a simple full circle of creme georgette over 2 layers of soft bridal tulle. 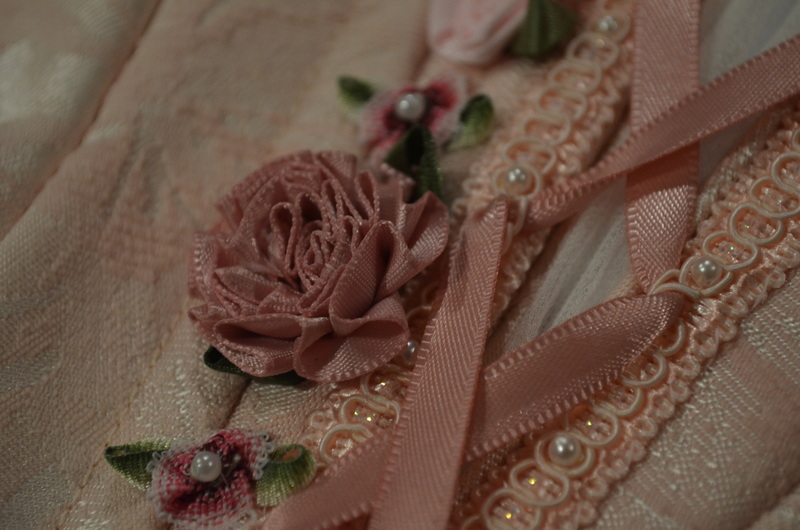 The skirt had a lightly gathered overlay of embroidered organza. Both top skirts were circular to minimise bulk at the waist and both were completed with a rolled hem using woolly nylon in the upper looper for a soft but defined hemline. 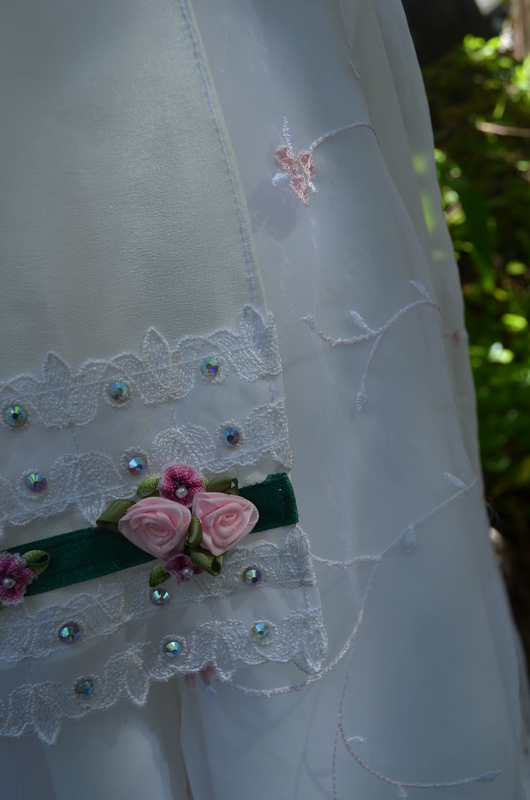 I finished off the top of the chemise with a pretty green and pink braid that I carried all the way around the top of the bodice.